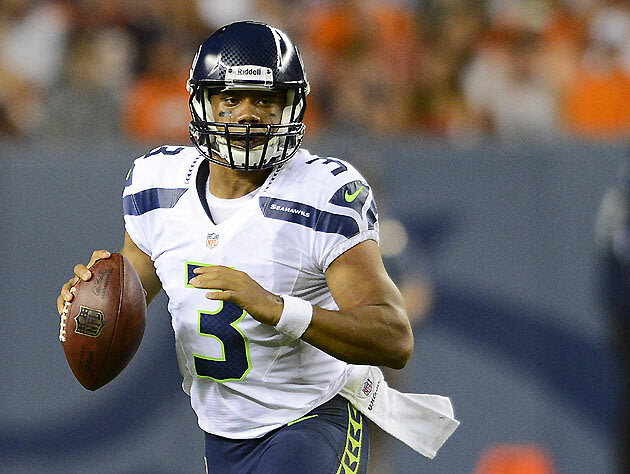 Unlike Russell Wilson, are Seahawks fans afraid to excel? No nerves, just production. Russell Wilson deserves his chance tonight. It perfectly sums up the 23-year-old’s rise to prominence. He could, theoretically, be a starting NFL quarterback in a couple of weeks. This despite being 5-10 in height. This despite having to change schools in college. This despite seemingly being destined for a career in baseball. It’s just a shame the Seahawks fans don’t have the same attitude. I don’t want to be too critical because there’s a reason for the ’12th man’ moniker. Nobody can match the noise inside Century Link field and truly this is a fan base that deserves more than one bitterly disappointing visit to the Super Bowl. But I do question whether they’re prepared to accept a bit of risk taking to get back to the big game. I’ve listened to media pundits and fans alike question whether Wilson should even be in the running to start. Some assumed it was Flynn’s job all along, despite repeated statements from the team that this was a competition. Some have even blown a fuse that Flynn isn’t the zoned-in focus going into week three of the pre-season. A lot of people want to play it safe. Whatever that means. Personally I’m more than prepared for either quarterback to start. I feel like this coaching staff has earned our trust and while we are right to question certain aspects, I think we also owe it to Pete Carroll and co. not to go over the top. People questioned the trade that brought Chris Clemons to Seattle. People questioned the move to put Red Bryant at defensive end. People questioned the trade for Marshawn Lynch. These are just a few examples. If Flynn is the starter in week one against Arizona, we can all assume Wilson just isn’t ready yet. Fair enough. Let’s see how Flynn rolls against the Cardinals. But if Wilson gets the job, people should be equally – if not more – excited. Don’t question it because it means they’ve decided Wilson is simply the better quarterback. Most people assume he has the higher upside because he almost certainly does. If he’s ready, why hold him back? To play it safe? What does that get you? Sure we can talk about Aaron Rodgers sitting in Green Bay, but that’s perfectly plausible when you have a first-ballot Hall of Famer as your quarterback. What’s more, Brett Favre never missed a game. Seattle doesn’t have that luxury. It makes so much sense to see what they have tonight against the Chiefs rather than simply assume the ‘safe’ position of just going with Flynn because, you know, he’s been around a little longer. If Wilson struggles against Kansas City, they will almost certainly go with Flynn against the Cardinals. But what if Wilson succeeds? What if he’s flat out better? It’s not improbable. What a wasted opportunity it would’ve been to simply go with Flynn as the conservative option if all along you had this superior quarterback on the roster. Yet some people believe that’s the way to go. And I don’t get that. Russell Wilson will be 24 in November. So while he’s a relative novice in the NFL sense, he’s actually played a ton of games at NC State and Wisconsin. Matt Flynn has attempted 569 passes in his entire career at LSU and Green Bay. Wilson threw 527 passes in one season for NC State in 2010. I appreciate that Flynn has valuable experience in the league as a backup and that does come with some value. We can’t ignore that. But while he’s been riding the bench at LSU and Green Bay, Wilson has been playing football games. And winning football games. And putting up big numbers in football games. So let’s not ignore that completely either. This is a different level for Wilson now, but does he look like a guy who needs to sit and watch for a year or two? Does he look out of his depth in the NFL? He’s drawing Denver off-side, he’s pointing at linebackers to distract them on the run, he’s shown tangible improvement to his play action fake in the space of one week’s work. He’s led five touchdown drives. The guy appears to know the offense and how to conduct himself as the central focus of it. He looks like a NFL quarterback. Maybe I’m tempting fate before tonight’s game. Maybe I’ll look pretty dumb if he struggles against the Chiefs. But even then, at least we’ll know he’s not ready. Those who are calling the decision to start him tonight ‘crazy’ were not speaking from a position of authority – they were just being overly cautious. If Wilson has issues and they say ‘I told you so’, they should be ashamed. Had Russell Wilson played it safe he’d probably be a baseball player now at whatever level. He didn’t. He wanted to be a NFL quarterback. It’s time Seahawks fans craved dynamism rather than conservatism. Craved elite rather than average. Took a chance or too to be great. And more than anything, don’t be afraid to excel. I’m in general agreement, and I know you’ve been on Wilson-as-starter from draft day. I don’t think starting Wilson is without unique risk. We don’t know just yet how well he’ll step up in the pocket and run the offense. Tonight will be a great test. I do think some of this hand-wringing is typical blown-out-of-proportion August hoo-hah. I feel pretty confident that Seattle is gonna walk out of this with at least competent QB play. I expect Wilson to fall on his face and come back to earth. I’m preparing myself for reality to set in. I don’t want reality, but I’m preparing for it. I want to watch a dream come true as we find an elite QB in the 3rd round like San Francisco did all those years ago when Joe Montana took the job (though not in his first year). That’s what I want. But I’m a Seattle fan. The best we usually get is an above average starter with a few Pro Bowls and that’s pretty good to have. But I’d love to see the beginning of a Seattle legend start tonight. That’s what I’m rooting for. Probably won’t happen. I certainly am not afraid to excel. I just don’t expect such a thing to happen to us. Doesn’t seem like thinks work that way for us. But who knows, it has to happen someday right? Why not tonight? Why not Russell Wilson? I’m glad Pete is “not afraid to excel”. If he had any other coach in this league, Russell Wilson would not be starting tonight. I truly believe this. Only Pete Carroll has the balls to start a 3rd round undersized rookie at QB because he earned it. For goodness sake just be a fan! I am so excited to see what Wilson is gonna do tonight, and I do think he is gonna be awesome! You sound like a big mouth without manners that won’t let another fan prepare himself the way he wants to prepare himself without tossing out an insult. So why don’t you direct your pathetic insults elsewhere. Or do you not have enough self control and weren’t raised well enough to address someone else in a courteous manner when conversing anonymously on the internet? Given your previous response, I imagine that is too much to expect. It is people like yourself that make the ignore button such a necessity when joining conversations on the Internet. Relax man! It’s all good! 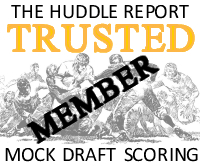 Wilson didn’t excel at the Senior Bowl, and he didn’t exel at the combine. He excelled in PC’s rookie camp, and he has improved significantly since that time (according to his QB coach). This shouldn’t surprise anyone: Wilson has a history of quickly learning a new offense, developing his skills to new levels, working harder than anyone to improve. He has done it his entire career. Not only does Wilson have the physical tools, he has demonstrated time and again his ability to run an offense, avoid pressure, make a play. He is a ‘quick twitch’ thinker (I just made that up). He makes quick decisions, and generally very good ones. And this will only get better with time. The hostility he has generated in the fan base is remarkable. Perhaps with the signing of Flynn, some kind of emotional commitment was made in many fans, a decision of sorts already determined, and the potential changing of that has them uncomfortable. Perhaps I am partially to blame, being a vocal advocate of Russell Wilson since well before the draft, and to this day. (In my defense, my comments always referenced sources and facts, along with judgments, as opposed to simple and unsupported declarations). But perhaps the animosity I engendered was deserved, and I am truly ‘heinous’, as one recent poster indicated. That advocation has led to countless personal attacks and my being banned from Field Gulls. Perhaps that entire fiasco has left a festering wound in the fanbase that had expected Flynn to start, and as a result, reflected itself negatively towards Wilson. Whatever the reason, the overall angst is hard to fathom. Seattle will field the best team they have had since 2005, and part of that excellence will reside at the QB position (albeit one perfectly suited for Wilson, with the defense PC/JS have assembled, the o-line Tom Cable has fashioned, and the array of offensive weapons that will be at Wilson’s disposal). Flynn would be a fine option at the position, if the Seahawks were shooting for ‘fine’ (8 or nine wins, maybe a play-off appearance, perhaps not). If they want to be great, they need a great player at the position. Right now Wilson is good, with the obvious potential to be great. If he plays true-to-form, the play-offs could be an exciting time for Seattle. The only angst was that you were arguing that we should start Russell Wilson before we had seen him play pro ball. Now that he is proving himself in preseason, I agree that we should start him. Before this game it wasn’t reasonable. It was utterly reasonable, based on what was known. Russell Wilson starting for the Seahawks has been the most likely (and reasonable) outcome since the 74th pick was submitted in April. Because it seemed so obvious to some people, and absurd to others, doesn’t make it any less obvious. What on earth are Seahawk fans going to talk about once the team has an established, unquestioned quarterback? I’ve only been reading Seahawk forums and blogs for about 4 years but in that time it’s been a constantly polarizing topic. I’ve been sucked in as well. I listened to most of a long podcast this morning, which I suspect, Rob, you may have heard as well, in which one of the arguments (over and over again) was that Flynn was obviously going to be the starter so why waste reps on Wilson. Other websites despair at Wilson’s happy feet, seemingly pining for Tarvaris Jacksonesque 8 yard sacks instead of 8 yard scrambles for a 1st down. I don’t get it. I don’t really care if Wilson leaves the pocket as when he does so he usually makes something positive happen. I’m quite happy to get behind Flynn should Wilson prove himself not ready, though, and believe that he would probably still offer a significant upgrade over Jackson and, dare I say it, 2009 and 2010 Hasselbeck. To me though, Wilson looks like a winner, pure and simple. Kind of like Tebow, but quite possibly not as nice and most definitely a lot more talented. And how good would it be to have a QB and LT both called Russell? I agree with taking some risk. If RW proves to be a more dynamic player, go with him. They haven’t stuck themselves withba Kolbesque contract with Flynn. Whichever one gives the Hawks the best chance to win in Pete and JS’s eyes is the guy I will get behind. Just psyched that they have a few seemingly good options. It’s time we grow a pair and play to win. I don’t mind failure, as long as success is pursued with reckless abandon. Greatness doesn’t come to those who are not willing to take a risk and put something on the line. It’s never given, only taken. I love Russell Wilson, I think he has a much higher ceiling, and he brings so much more excitement. I was never really very enthusiastic about the signing of Matt Flynn, an unproven back-up QB. I think with either QB, there will definitely be some growing pains, but neither is proven yet, and if Flynn shows he is only a one game wonder mid season, then we are at square one. If Wilson can play with the poise he has shown thus far, I think we have found our QBOTF. I’m glad my expectations were exceeded. I prepared myself for disappointment and was instead amazed. Let’s roll with Wilson. I’m sold. If this is Wilson with no NFL experience, I can’t wait to see Wilson with NFL experience and a high end group of receivers. This is our guy for the next 10 years barring injury. Let’s not even play around any more, Pete. This is our guy. The fan base loves him. Get the receivers solid and let’s get the offense start building chemistry. Damn. I can’t believe we found a guy this good in the 3rd round. Impressed! Would love to see more of your reflection of current hawk players and their progression from draft day! Best blog out there. RW just tore up KC. One bad pass all night. Couple of jump balls maybe could go either way. Some kind penalties. That said… man. Holly poop, batman. You can feel him. He is cool at all times. Arm is sweet. Trajectory is really nice. Catch-able ball. Great feet. Poised. Understands the offense. Enjoys the competition at the highest level. This is not too big a stage for RW. It is 2003 all over again. Many hours of wasted time is about to be spent by myself watching a beautiful thing take place in Seattle. What a feeling. The only knocks that I had against Russell Wilson came from Pete Carroll. Carroll said that Wilson had had trouble picking up the defense prior to the snap and going through his progressions. Well, after KC, we can’t say that anymore. Wilson was flat out amazing. He had two bad passes all night; one overthrown, and the only catch by Terrell Owens. That second pass was horribly underthrown. That shocked me because Wilson has a stronger arm than Matt Flynn. If Wilson had had trouble going through his progressions, then Eric Berry would’ve batted down passes, or picked him off. The KC defensive backs were non-factors. The KC game showed that he has adjusted very well. Wilson has grown week to week. The kid is scary good. He’d growing by leaps and bounds in front of our eyes. Flynn reminds me of Matt Hasselbeck, while Wilson reminds me of Ken Anderson. Anderson should be in the Hall of Fame. Not only was he the first west coast offense qb, but he excelled against so many doubts. I’d love to see Wilson’s career parallel Anderson’s, with a few exceptions: Super Bowl wins.